Last week was FAVA FEST, the annual celebration of independent media art in Edmonton put on by The Film And Video Arts Society – Alberta. As part of the celebration, FAVA hands out Awards Of Excellence. I submitted the video Doug and I made last summer for consideration as Outstanding Music Video, and an early cut of This Wind to be considered for Outstanding Short Narrative Film Or Video. 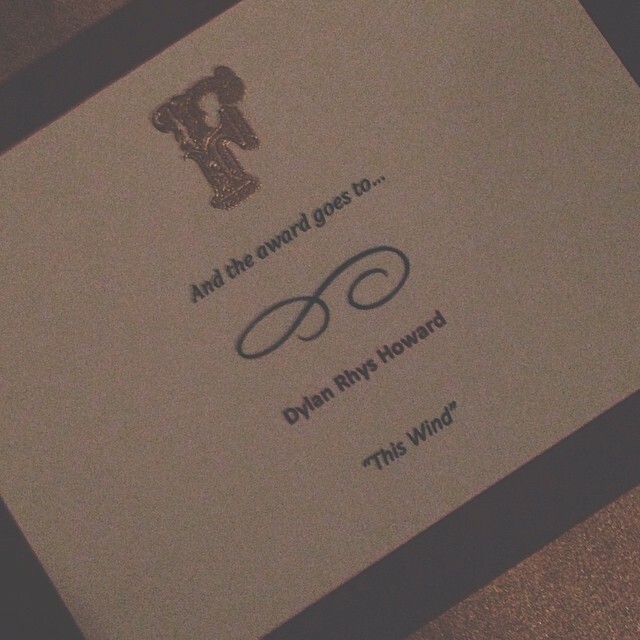 To my great delight, the jury selected This Wind as their choice for the Short Narrative award. I was thrilled to accept it on behalf of everyone who put their time and work into making a terrific little movie. And now, as we start submitting to festivals, I’m hoping that this means people will want to see this movie in other places, that perhaps this is just the beginning for this film. I have a good feeling that’s the case. Outstanding Music Video went to my friend Christina Ienna for this Shred Kelly music video in which I star as the leader of a band of hooligans known as “The Cheatahs.” Outstanding Short Documentary went to this amazing segment of an upcoming longer work by my friend Lindsay McIntyre about the death of film, made on handmade film! Eva Colmers’ beautiful film, Autumn, shot and edited on 16mm, was named Outstanding Experimental Film, and my friend Parker was honoured with an award the jury basically made up just for him because his movie didn’t fit in any particular category: The Spirit Of FAVA Award. It was inspiring to see these great movies over the course of the week, and I’m honoured to call these fine filmmakers my peers. FAVA FEST was amazing all week long. I wish I could have been there for every second. In addition to showcasing great local work, two A-list shorts programs were screened: The Cinema Eye Honors Shorts Program, which showcases some of the best in creative non-fiction from around the world, and we were also able to bring in the Sundance Shorts Program from 2013. Both of these programs reminded me of the power of short film, and got me excited to make something new. Soon. Onward and upward. Please check out the page we’ve made for This Wind and watch for any updates. We hope to have something to share on the festival front soon, but we probably won’t until the big Canadian festivals announce their lineups in the fall. Lots to do in the meantime – working on a new music video for Scenic Route To Alaska among other things! Stay tuned.